It’s about time for another round of Making it Yours (MiY), don’t you think? 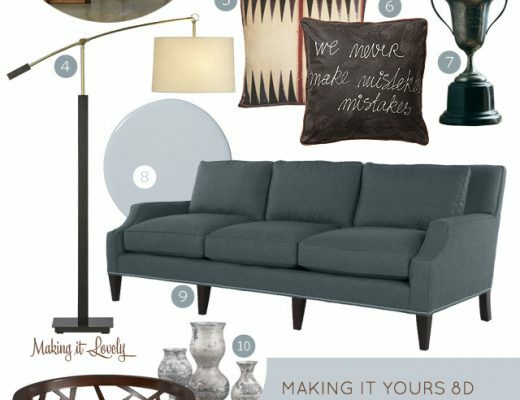 MiY explores ways to use stylish investment pieces for the home while keeping up with changing lives and changing tastes. In this third edition, I’ll be focusing on the ever popular Madeline Weinrib Zig Zag Rug. It will start out in the home of a young woman who has just splurged on the rug (it’s the most expensive thing in her apartment! ), then make its way with her through several changes of residence. Nothing here is extraordinarily expensive, but our young apartment-dweller is starting to gather some nice things for her living/dining space. IKEA’s Karlstad with a green slipcover is a great sofa for only $499, and the hot pink chair is a fun addition to the room. Wicker chairs keep things light and airy, and the tee pee dining table is a piece that will be loved for many years to come. The pink lamp is a steal at just $49 (on sale), and it would look great on a substantial white blocky table. White wall flowers and a pink print dress the walls, and a cute pillow sits on the sofa. Next up, we’ll see the rug move into the bedroom. I love that Target chair! It looks like a nice place to sit and read for a while. Great eye for color combination, as usual! Yay! I’ve been waiting for another MIY. 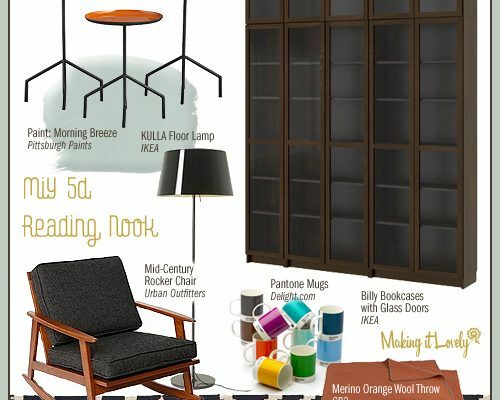 I love that CB2 table, I wish CB2 would come to Australia. I LOVE this room, it’s absolute perfection for me. I’ve loved that rug for a while. By “most expensive thing in her apartment” how expensive do you mean? I can’t seem to find price info. An 8’x10′ is about $1000. Wonderful picks! I especially love the print and the Lucy chair. Gorgeous finds. I love that rug but can’t believe how expensive it is! I can’t wait for the bedroom! That lamp rocks my socks! 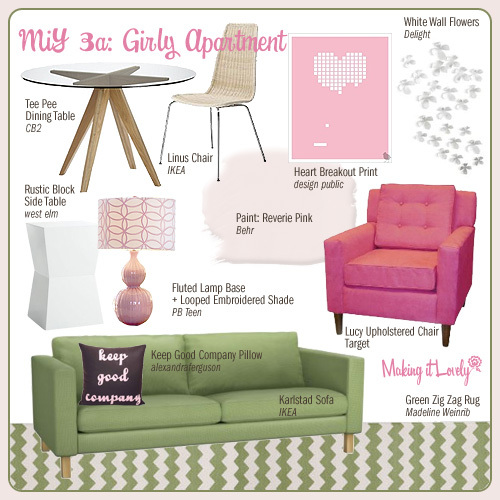 As a girl just starting out in her first girlie apartment, I’m loving this edition of MIY. Now, if only I could afford a Weinrub rug– sigh. so cute! that table is awesome. I love your MIY feature and I’m glad you’ve brought it back! The MW zig zag rug is a great choice and I can’t wait to see what you do with it next. I love it, it way too pretty! I love the Lucy Upholstered Chair! What is the rug made out of (cotton, wool)? I recently bought a beautiful 8×10 green/cream cotton rug for my living room but my 1 year old spilled water on it and it stained. Yes, water stained it. Apparently cotton rugs are prone to “browning” when they get wet with water so they cannot be cleaned. I’ve had my rug about a month and it already needs to be replaced. This rug would be perfect – as long as its more durable! I love it! Pink and girly are my thing. Wish I could have these at my dorm room. I love this room! I would love to see one installment of the rug accommodating a man’s need for masculinity in a room. Like when this “girl” moves in with a “boy.” :) I showed my husband this room and all he could say was “it’s too feminine.” Disappointing! such a cute inspiration board! but while it is a very cute couch in pictures- i highly advise against it. i had recommended it to a friend as it would be easy to take up the elevator of his high rise unassembled… which was true. however that was the last nice thing about the couch. it is truly SO uncomfortable and after a day of use, it looks worn out and ugly. just sharin…. I adore this series and that rug. But thinking about my first apartment through now there have been lots of red wine spills on lots of inexpensive (thank GOD) rugs. I’m just now feeling adult enough to splurge. WOW! BIG WOW! Pink..pink..pink…I just love pink..
LOVE the Alexandra Ferguson pillow. I am ordering the Be Nice or Leave version. LOVE THIS! Thanks for sharing your taste. LOVE the lamp. This is the apartment Peggy on “Mad Men” would have if Peggy were more fun. Loving the pink chair.